Book reviews, and my personal reflections about writing. A collection of essays relating real-world strategies to examples from the ‘Star Wars’ franchise. As usual with this kind of book, some were good, and some not so good, and there were a few that didn’t do much for me, and/or seemed to repeat themselves (as well as be repeats of others). 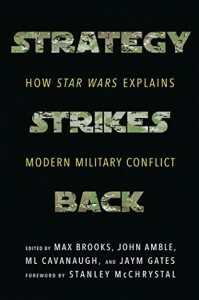 Still, I found it interesting, and a good starting point for more reading, since many of the essays don’t only rely on Star Wars, but also on actual strategy theories (Clausewitz, modern strategy-related articles, and so on). Having only watched the movies, and not the animated Clone Wars series (and not having laid my hands on more than a couple of books from the former SW extended universe), I can’t speak for the accuracy (or not) of the essays discussing, well, other aspects of SW. From what I know, though, these essays are fairly accurate in their interpretation and depiction of the chosen excerpts from the movies. Rating: 3.5 stars. Apart from the couple of points I made above (mostly the redundancy), I think it’s more interesting in terms of Star Wars than in-depth military strategy, and I’d have appreciated seeing more examples of real-world situations contrasted with the SW ones.